We must examine the basic assumptions and what happens at each point in the apparatus to determine what is important to obtain a robust (repeatable and accurate) measurement and spectrum analysis. A(Z,True): actual or “true” number of x-rays/second of the principal line of element Z (line type K, L, M) leaving the sample surface in the direction of the detector [ point 2 in the block diagram]. This is a very simple equation with a great deal hidden in the details. - within the detector crystal many things occur to modify the energy signal but in simple terms each x-ray that interacts within the crystal volume, and not all do as some may traverse the entire crystal without interaction, will produce a signal proportional to the energy deposited in the crystal. The end result is that each x-ray results in the production of electron-hole (e-h) pairs with the number of such pairs proportional to the energy deposited. However, there are mechanisms for loss due to energetic electron escape, the escape of detector element x-rays, charge trapping etc. that result in a smearing out of the line shape. - Electrical noise and the statistical nature of the e-h production process results in a broadening of the main peak, which is usually assumed to be Gaussian but is better represented by a Voigtian profile to account for the natural line width of the characteristic x-rays. - As a result of the losses and broadening a narrow x-ray line results in an observed signal showing a broadened main peak with low energy structure that can include short and long range tailing features and escape peaks characteristic of the detector material. This represents a very simplified view of what occurs in the detector and the details would have to be the subject of a different discussion. will combine together into a term we will call the intrinsic detector efficiency, Dint(Z) , which represents that fraction of events that produce a full energy signal in the pre-amp trace. The preamplifier signal now enters the processing electronics, whether analog, digital or some combination of the two, where it undergoes further modification. The main job of the processor is to recognize the signature of an event in the pre-amp trace and determine its amplitude (which will be proportional to the energy of the originating event) in order to place it into the observed spectrum. We combine all of these factors together into a term we will call the electronic detection efficiency, Delec(Z). This value will be rate, spectral, noise and possibly energy dependent. Delec(Z) is the fraction or full energy preamp events that show up in the observed spectrum in the main peak, not as a degraded or pile up event. In simple spectra, with well-separated peaks and no background, peak intensities can be estimated accurately by summing over regions of interest (ROI) for each peak. Adding background complicates the procedure as the background under the peak needs to be estimated and subtracted from the peak intensity. In its simplest form, this is often accomplished by estimating the background to the left and right of the peak and making the appropriate subtraction in the peak region. As spectra become more complex and one peak structure begins to overlap another peak structure these simple procedures are no longer adequate. This is where FP can be useful. An FP database can be used to obtain the relative line intensities for each series of x-rays for each element (K, L or M). These line intensities are modified relative to one another for thick target, absorber and detection efficiency effects via FP calculations. A model spectrum can be built and fitted to the observed spectrum with the fitted intensities providing the necessary estimates of the principal line peak area. Overlaps from lines of one element with another can often be adequately handled in this manner. Each element has more than one line with their relative intensities known, which provides a basis for separating the intensities of the overlapping peaks. This takes care of the 1st term in Eq (1) - so now we have to deal with the 2nd term, the calculated theoretical yield term Y.
N(E): is the number of source x-rays striking the sample/second as a function of energy E at point (1) in the block diagram. Often the energy spectrum is given in binned form allowing sum calculations as opposed to integral calculations. G: the geometry of the measurement that includes the angle the source beam makes with respect to the sample surface, the angle the sample x-rays make with respect to the detector crystal and the solid angle the detector crystal makes with respect to the sample. - The angles a, q define the path that the source and sample x-rays take within the sample. In thick targets both of these angles are important, as errors in these angles will result in incorrect path lengths and calculated yields. - In thin targets, where there is no thick target correction, only a is important as the path experienced by the source x-rays is not d but is instead d/cosa. - The solid angle in steradians the detector crystal (C) makes with respect to the sample is essentially the detector crystal (collimated) area divided by the square of the distance from the sample surface to the crystal surface. - Whether a thin or thick target, the solid angle is important as it determines the fraction of events that could be detected. This value is often ignored but shows up in either the instrument calibration factor or the overall source beam intensity. However, it is better to include it explicitly as it can point to issues with the measurement. 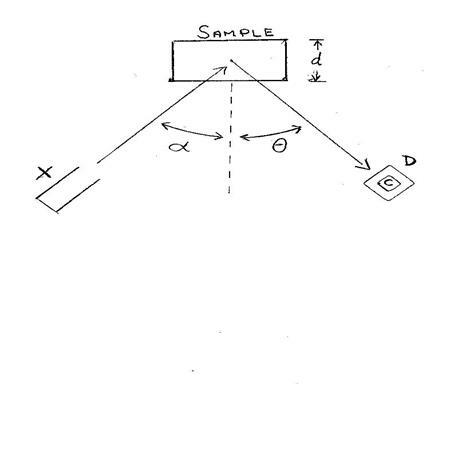 - In some cases the solid angle can be complicated to calculate when the detector is placed close to the sample and the sample is light enough and thick enough to have a significant depth profile to its yield as the x-rays originating from a greater depth will have a smaller solid angle of detection. - The sample thickness d is one of the variables that must be known, measured or calculated in x-ray fluorescence analysis. Sample thickness is defined here as areal density (g/cm2). It is not sufficient to know or measure the thickness in cm (mm or mm) it is necessary to also know the sample material density as it is the areal density that is used to calculate the attenuation of x-rays, both source and sample, in the sample material. - For very thin samples the yield is essentially linearly proportional to the areal density, however as the sample thickens the incremental yield decreases exponentially until you reach the “thick” target status and there is no increment in characteristic x-ray yield with further thickening of the sample. - If the sample is sufficiently thick such that the source x-rays are totally attenuated by the sample or at least the sample x-rays of interest cannot penetrate the entire thickness then knowing the actual areal density or thickness is usually not necessary. The exception to this rule is in light element matrices where 10 keV x-rays may penetrate several mm and 25 keV x-rays may penetrate several cm resulting in a changing solid angle of detection in typical set-up geometries. - This table shows estimates of depths by which 50% or 90% of the total yield will have occurred for x-rays of various energies in a gold, iron or polyethylene samples. - for medium to high Z samples the analysis depth is measured in mm. This means that samples of the order of one mm thick would be considered thick targets in most of these cases and the actual analysis depth often does not exceed more than a few mm . - the table indicates that in low Z element samples the targets are often not “thick” unless they exceed many cm’s which is rarely the case. Also the densities of many plastics depend on the manufacturing process so that it is the responsibility of the analyst to know the basic structure of the material they are analyzing including its density and thickness or simply areal density. - The path length of interaction of both the source and sample x-rays via the energy dependent mass attenuation coefficients. In most analytical instruments, x-ray tubes, with or without pre-filters or secondary targets provides the primary source of x-rays. With x-ray tubes defining the “EXACT” spectral shape and intensity striking the sample is problematical. FP calculations rely on calculated x-ray production yields with one of the factors being the energy dependent ionization cross-sections. These cross-sections essentially decrease rapidly above the shell binding energy except in the energy region just above the edge (dashed line circled region) where oscillatory fine structure effects can occur (XAFS or XANES & EXAFS) – but this is beyond the scope of this discussion. Each element in the sample can only be excited by that part of the source spectrum above the shell binding energy (EB), BUT is most excited by that part of the energy structure near the edge and much less so by that further away. Therefore “shape” as well as intensity can be of critical importance. This is why the best these models can provide is an approximation of the x-ray spectrum striking the sample which may be quite adequate for some samples and much less so for others. Equation (1) provides the basis for a standardless FP calculation of elemental concentrations with the accuracy of the conversion to concentration depending on the accuracy of all of the factors discussed previously. Any deficiency in the spectrometer description, assumed x-ray spectrum striking the sample, or the physics database used to calculate the theoretical yields will translate directly into errors in the calculated C(Z) values. If everything is known perfectly then H(Z) will equal 1 for all Z. When it is not known perfectly then the departure of H(Z) from 1 represents the instrumental error (or fitting error) at that Z as well as the error that would have arisen in a standardless FP calculation. As the Cambridge Scientific FP EDXRF analysis software (CSXRF) will be used in the Gold Alloy case study to be presented later, a brief description of its handling of the x-ray source spectrum issue and the H(Z) factors is in order. - one for the characteristic line intensity of the pre-filter. Not all parameters need to be varied in the fit each time as often the end point energy is well known, and there may be no characteristic lines from the anode or pre-filter depending on the particular arrangement. Information is collected from one or more standards and then the source model parameters are fit to the criteria that H(Z) will give the best possible fit to 1. The main advantage provided by the H(Z) is that it allows for some systematic error in the description of the instrument, as long as the errors are not time, rate or spectral dependent. 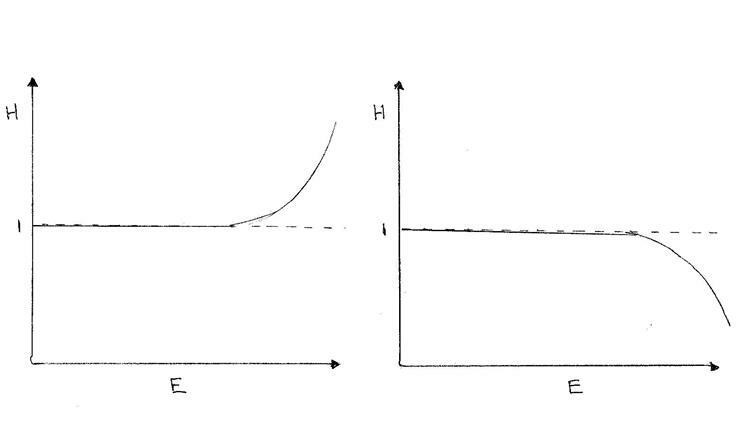 In fact, the shape of H(Z) as a function of Z or energy (its systematic departure from 1) is often useful in diagnosing system description errors. One example of this is that of the x-ray absorber whose nominal thickness or density is wrong. 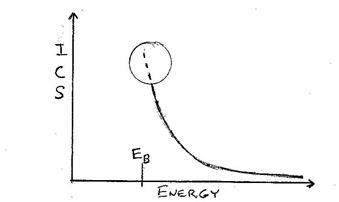 This can make a great deal of difference in the Z and upper energy range where the efficiency is starting to decline exponentially. In general, small time independent errors can be readily compensated for using Hybrid FP analysis via the H(Z) values. The more closely the standards match the samples the better the compensation will be. However, some things are difficult or impossible to compensate for via H(Z). that does not change without your knowledge. Another factor that is difficult to compensate for via H(Z) is any time, rate or spectral dependent factors such as the electronic detection efficiency, Delec(Z). for each sample spectrum acquired. - some means of estimating the number of x-rays lost to discrimination or pile up. This includes partial pile up and pile up with noise. In many situations this may be sufficient but the ‘robustness’ would be improved by measuring standards similar to the sample with similar live time fractions both before and after each sample checking that the post sample results match the pre sample results. Although this requires more work and cannot guarantee the sample measurement was done under the same circumstances it is highly suggestive and reassuring. Even then the robustness could be improved if each measurement, whether standard or sample, gave sufficient information unto itself to make such a determination. 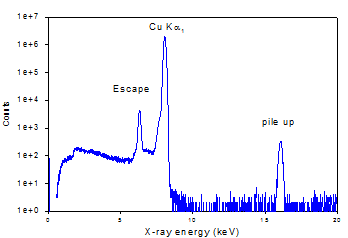 For illustrative purposes we show a simple mono-energetic Cu Ka1 spectrum with the rejected spectrum shown overlapping the accepted event spectrum. The accepted spectrum (solid black line) looks normal with a main peak at about 8 keV, an escape peak, some tailing and a sum peak at 16 keV. The CSXRF program has been designed to take advantage of this extra information provided by the rejected spectrum to determine the true event input rate by subtracting the noise only events and multiplying the pile up events by the appropriate count per event. In this simple spectrum the true input rate can be quite accurately estimated. Algorithms for estimating the true input rate in more complex spectra have been developed and implemented in the CSXRF program. 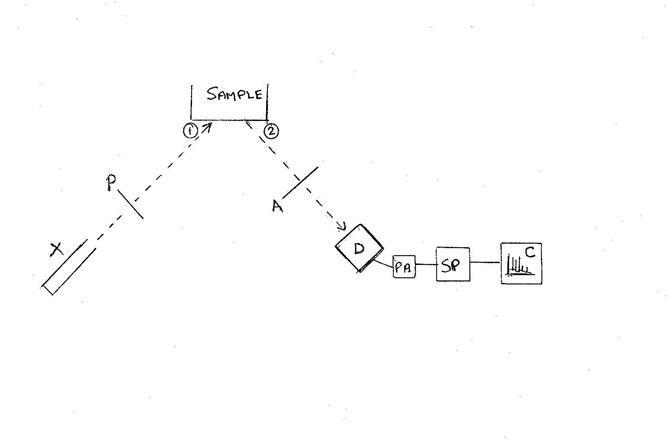 The CSX processors also provide a measurement mode for obtaining the interspike time histogram, which can be used to validate assumptions about the Poisson nature of the process. If it is determined that the sample x-rays arrive with a Poisson distribution an analysis of the interval histogram provides another measure of the true input rate. 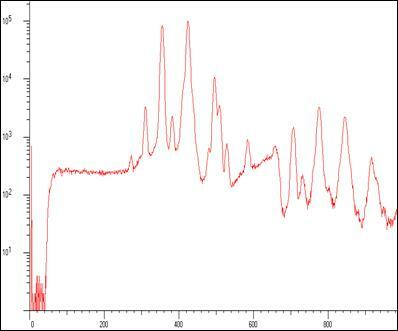 A Pb spectrum (260 kcps input rate) showing Pb L’s and 1st order sum peaks taken on an industrial XRF machine. 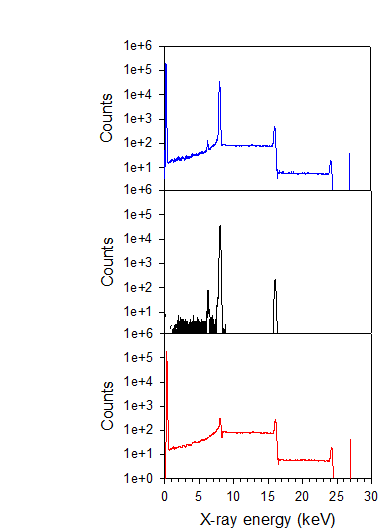 The interspike time distribution (at two different tube currents) shows non-Poisson behaviour implying that the x-ray tube production fluctuated. 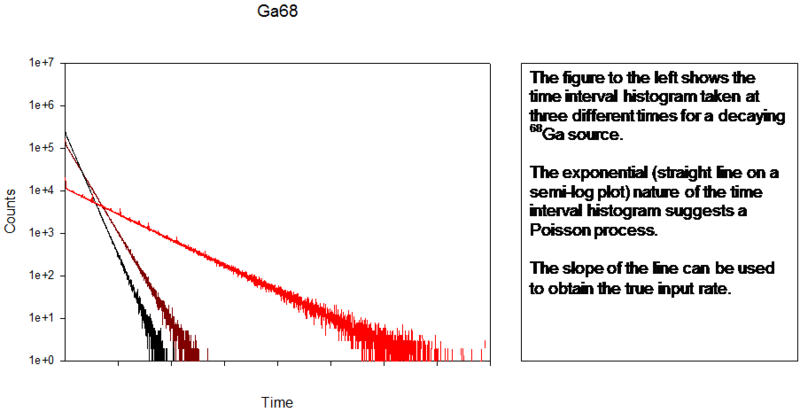 With most processors the Poisson assumption has to be used to estimate pile up loss and dead time. In this case that would not be possible. However, the CSX rejected event spectrum makes the assumption of Poisson behaviour unnecessary. So far we have discussed one reason for using standards that are similar in nature to the sample to be measured. That is to provide roughly the same spectral shape and live time in cases where the rejected spectrum is not available for analysis. If FP calculated yields depended only on the primary production for each Z then one could measure pure element standards to obtain H(Z) for each element and occasionally measure one or more between samples to make sure conditions are not changing. 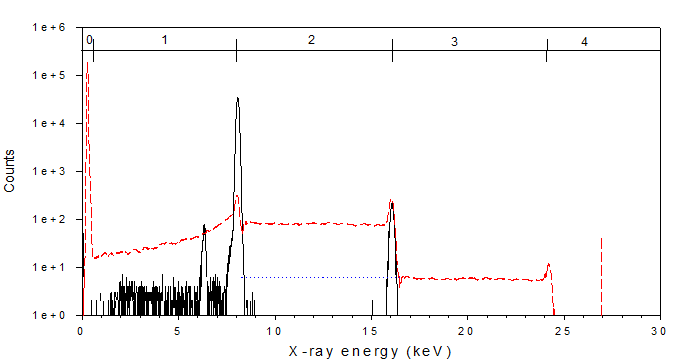 A good representation of the source x-ray spectrum striking the sample. This includes the overall intensity but is primarily about the spectral shape. However in general measurements, where secondary fluorescence contributes to the yield, if the shape is poorly represented then as the sample element concentrations begin to differ from the standard element concentrations the errors will begin to increase and a robust measurement is not possible. - layered targets (especially those with unknown thickness) are the toughest test of FP in XRF as they generally require accurate knowledge of all aspects of the measurement system from the source to detector and are often difficult to provide a good standard for corrections of improper assumptions. The final component in FP analysis is the software used to obtain the element peak areas from the spectrum and convert those to concentrations. - in hybrid analysis, where standards are measured, the correction factors to be applied to each element of the sample analysis have to be calculated, stored and then used to convert the adjusted peak areas of the sample spectra to concentration values via the FP theoretical yield calculation. of the measurement being done. Several packages are in use but the one we use here is the Cambridge Scientific FP EDXRF analysis program – CSXRF. A brief description of this software is given below. - each element line series (K, L, M) is represented by the intensity of the principal line of that series with all other lines tied to that principal line via a library of relative line intensities adjusted for differential absorption, detection efficiency and thick target effects. If so desired the line series for the K lines can be further divided into Ka & Kb and the L lines can be divided into their sub-shell components L1, L2 & L3. In this case an OEM was using the CSXRF software for the purpose of obtaining the concentration of elements in gold alloys using their own spectrometer system. Here we are looking at alloys consisting of up to four elements, Au, Ag, Cu, Zn, all of which provide visible x-ray peaks in the spectrum and whose concentrations must sum to 1. This fits the general case of having to know the spectral shape of the source x-rays striking the sample but not the actual intensity. Variation of the tube current does not matter as long as it DOES NOT alter the spectral shape. It is up to the manufacturer or analyst to confirm that for their equipment. As the OEM does not provide an x-ray tube excitation spectrum for their various configurations of different tubes, anodes and primary filters it was necessary for the FP program to estimate the spectral shape based on the minimal information provided by the equipment manufacturer including anode Z, window material and thickness and primary filter Z and thickness. The table to follow shows the results of their analysis of 60-second measurements of 20 gold alloy standards. 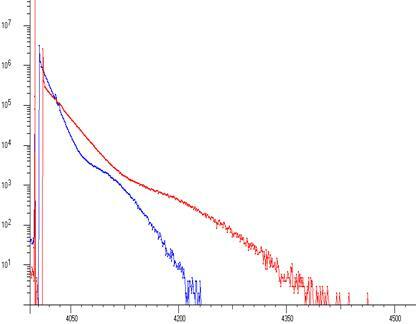 The spectra were generated using an W anode x-ray tube and 50 mm Ta primary filter and collected using a 13 mm2 400 mm thick Moxtek SiPin using the OEM’s signal processor. Although no counts or errors are listed the FP analysis provides good agreement. Of particular note is that low concentration Zn is difficult to measure in a high concentration Au/Cu sample because the Zn Ka overlaps with the Au Ll line as well as the Cu Kb lines and the scattered x-ray tube W anode characteristic radiation and the Zn Kb lies on the leading edge of the Au La peak. Also the Ta primary filter, with L3 edge at about 9.9 keV although good for suppressing the bremsstrahlung radiation from the tube in the Au Lb & Au Lg region is not as effective in the energy range below 9.9 where the Cu, Zn & Au La peaks reside. Longer measurements (or higher count rates) in order to provide greater statistical accuracy may be required in order to obtain better Zn values in these cases. - this generated excitation file along with the H(Z) value files were then used to analyze the sample spectra in IM (iterative matrix) mode to produce a table of concentration values that we see in the above table. In iterative matrix mode the sample matrix composition is iterated (and in this case scaled such that the concentrations summed to 1) until the results converge. Although we were not provided with the spectral data files that resulted in the table we were provided with a few spectrum of these gold alloy materials collected at a prior time using this system and reported these analyses back to the OEM for their action. Spectra for 1, 13 & 14 were obtained and analyzed with some of the results and comments reported below. We analyzed #13 and used that spectrum as the standard for analyzing #1 & #14 as well as reanalyzing #13 to ensure self-consistency in the calculation. One of the numbers reported by the CSXRF code in IM mode, in the case where all of the elements produce peaks in the spectra, is the H correction factor. This factor is the scale factor that is required to multiply all H values in order for the concentrations to sum to 1. Since #13 was used as the standard to produce the excitation spectrum and the H(Z) values its H correction factor is 1. This is a useful cross check. However, the H correction factors for the #1 and #14 samples were 1.32 and 1.42 respectively. The constraint of the concentrations summing to 1 allowed useful analyses for gold alloys (and by extension to similar types of systems where the sum of the visible elements and any associated invisible elements must sum to 1). In this case the widely varying H correction factor indicates that the equipment has one or more problems that need to be addressed before proceeding to more complicated analyses. This is what we reported back to the OEM for their action. than simply push a button and record a result. - standards should be run to higher than normal statistics in order to reduce the statistical error in the standard element fits that translates directly into errors in the associated H(Z) values. Remember most software packages will report errors in the fitted peak but have no idea about systematic errors or errors in the calibration constants. - reanalyze the standard spectrum as a fixed matrix sample to ensure that you are using the right excitation and H(Z) files. - for any given set of standard and sample measurements the x-ray tube voltage should remain constant as changing the tube voltage would change the x-ray spectrum shape. Even changing the tube current in order to change the source intensity should be approached with caution and its effects investigated on your spectrometer. and deal with them appropriately. In pure standardless FP analysis every aspect of the spectrometer system must be well known. In Hybrid FP analysis the use of standards to characterize the instrument compensates for some inaccuracies in the system description. Additional knowledge may be required depending on the type of sample being analyzed. Ideally every aspect of the measurement system is well characterized, a suitable standard is available for system checks and an adequate software package is available for the analyses. However this is generally not the case and this is why we have to evaluate the robustness of a particular FP analysis system from the measurement apparatus to the FP analysis code for each type of measurement to be done.